Poppies & Posies Design Co.
Poppies & Posies is a boutique design firm based in New York City & New England. The owners & creative directors, Juliet Totten & Sierra Yaun, are passionate about what they do and believe in creating unique and memorable affairs to celebrate lifes most important moments. Whether youre design draws upon vintage, modern, or rustic elements, Poppies & Posies will search high and low for the perfect items to bring your vision to life. 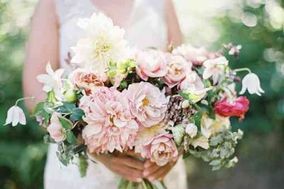 Fresh flowers are composed in a loose, organic, style and mixed with unexpected elements such as branches, berries, fruits and vegetables to create imaginative, garden inspired arrangements for your special day. We are happy to take on as many or as few of the decorative elements of your occasion as you would like. From flowers to favors, we love to custom design each detail of the events we create to make sure they are as unique as you are!